Crossed the border into Northern Ireland this morning and straight away you notice the flag flying. All the villages that support the monarchy have flags everywhere and red, white and blue lamp posts and even kerbing is painted in the three colours. Driving into Londonderry/Derry we followed a diversion and the bus ended up stuck at the bottom of a very steep hill. It caused traffic chaos and we had to get the police to clear the traffic and then reverse all the way back up the hill! We had a very interesting tour with a local guide Ronan - he showed us all the murals then took us up to the city walls and told us all about the 'troubles'. Headed on to Belfast which is a lovely city. Saw where the Titanic was built, where Game of Thrones is filmed, largest cranes in the world, as well as all the usual impressive buildings. 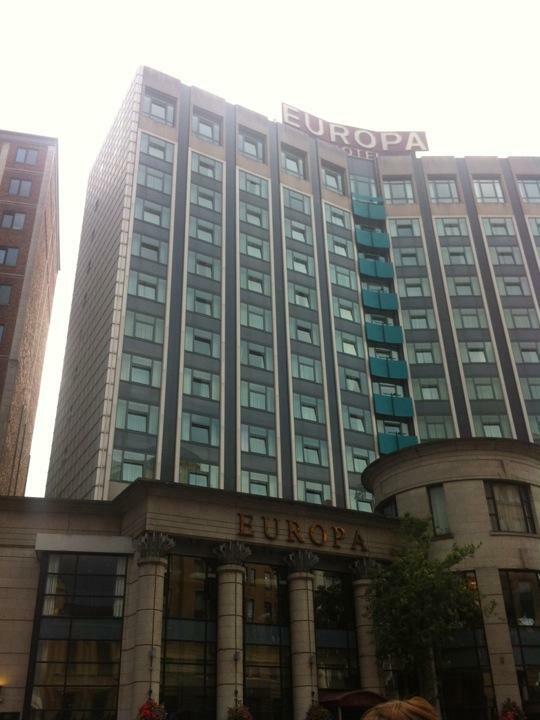 We stayed at the Europa hotel where all the famous people stay and saw the bearded transvestite who won the Eurovision Song Contest. Had drinks at Belfast's most famous pub the Crown which has 'vaults' (individual booths that are completely enclosed with doors and everything and where you ring a bell for service.) Had a Magner's cider!